There are 43 days left in the PGCBL regular season, which ends on July 30. Amsterdam 7 Glens Falls 6: The Amsterdam Mohawks overcame a late deficit to walk-off against the Glens Falls Dragons, 7-6. Brendan Tracy hit an RBI single that scored Hunter Tackett in the bottom of the first to make it 1-0. Tracy scored later in the inning on an error by Glens Falls catcher and two more runs scored in the inning on another error. Glens Falls got two runs back in the top of the fourth on an RBI double by Jake Vieth and an RBI single by Oscar Rodriguez. A Vieth sacrifice fly in the top of the fifth pulled the Dragons within one run at 4-3. A three-run top of the eighth gave Glens Falls its first lead of the game. Rodriguez hit a two-RBI single to make it a 5-4 game and Zach McIlroy followed with an RBI double to score Rodriguez and add an insurance run. Amsterdam got a run back in the bottom of the eighth on a bases-loaded walk. The Mohawks tied the game in the ninth on an Andrew Rouse bases-load hit by pitch. In the bottom of the tenth, Aiden McDermott hit an RBI double that scored Tyler Kirkpatrick to win the game for the Mohawks. Tyler Smith tossed two scoreless innings of relief for Amsterdam to get the win. Mike McFerran allowed the walk-off run in taking the loss. Mohawk Valley 2 Victor 0: The Mohawk Valley DiamondDawgs took a no-hitter into the eighth inning and went on to beat the visiting Victor RailRiders, 2-0. Utica 3 Adirondack 0: The Utica Brewers shutout the Adirondack Trail Blazers in Boonville for their second win in a row. Kyle Schade brought home the first run of the game in the top of the fifth with an RBI single that scored Nick McIntee. Schade hit a two-run home run in the top of the ninth to give the Brewers some insurance and make it a 3-0 game. Daniel Gober tossed five scoreless innings to get the win and Jack McClure did not allow a run in four innings of relief to earn the save. John O’Reilly took the loss for Adirondack. Elmira 10 Newark 3: The Elmira Pioneers used a six-run sixth inning to cruise to a 10-3 win over the Newark Pilots at Dunn Field. The Pioneers jumped on the board early, scoring two runs in the bottom of the first. Christian Santisteban and Hayden Kelly both hit an RBI double. A Justin Hayes single in the second scored the third run of the game and Santisteban went yard in the third to make it 4-0, home team. Elmira erupted for six runs in the sixth inning to put the game out of reach. Jordan Bishop scored the first run of the inning on a Justin Hayes groundout, a Santisteban RBI single scored the second and an error scored the third. Santisteban scored on a Josh Lovelady single and an error allowed Lovelady to score on a Taylor Hillson single. Newark scored two of its three runs on a Willy Yahn two-RBI double in the top of the eighth. A fielder’s choice in the top of the ninth brought in the third run. Kyano Cummings struck out 10 Pilots in six scoreless innings to earn the win for Elmira. Nathan Suyematsu allowed four runs (three earned) in two innings in taking the loss for the Pilots. Albany 3 Saugerties 2: The Albany Dutchmen rebounded from a loss to Utica on Monday, using Saugerties’ miscues to walk-off to a 3-2 win. A Pat Dorrian fielder’s choice scored the first run of the game in the top of the first for Saugerties. An RBI single by Dorrian in the third scored John Novenche and made it a 2-0 game. Albany scored a lone run in the bottom of the fourth to cut the lead in half. In the bottom of the sixth, Tyler Nelin scored on an E2 to tie the game at two. With the score tied at two in the bottom of the ninth, Adam Gauthier scored on an E5 to give the Dutchmen the victory. Blake Allen tossed an inning and two-thirds of scoreless relief to get the win for Albany. Justin Emmerling took the loss for Saugerties. Elmira at Victor 5 p.m.: After Elmira won the first game between the two teams, 4-3, on Saturday, the Pioneers and Victor RailRiders will meet once again, this time in Victor. 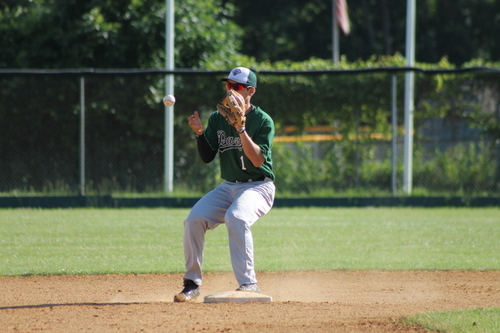 Mohawk Valley at Saugerties 6:35 p.m.: Coming off a win against Victor, the Mohawk Valley DiamondDawgs will look to stay above .500 against the Saugerties Stallions on Wednesday. Amsterdam at Adirondack 7 p.m.: Amsterdam will travel to Boonville for the second time in four days to take on the Adirondack Trail Blazers. Newark at Glens Falls 7 p.m.: Coming off a loss against Elmira, the Newark Pilots will travel to Glens Falls, where they will look to stay in first place of the West Division.